Occasional jottings of an incurable entrepreneur on the business and technology behind cloud computing. 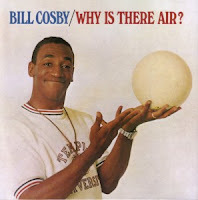 I know I'm dating myself, but Bill Cosby had a pretty funny routine where a PE Teacher explains that the purpose of air is to pump up basketballs and volleyballs. Now Adobe has launched their Air product (with a matching Kevin Lynch NY Times article, and GigaOm fan dance) to allow platform to allow browser apps to escape from their little Firefox and IE prisons and flit gaily across the desktop like "real" apps. I can click an icon on my desktop instead of a bookmark in my browser. Yawn. I can run an application without the browser border. Snore. Excuse me, but I prefer Bill's definition of why we need air. As I have written, Air, Flex and Silverlight are"back to the future" approaches for Rich Internet Applications that would have us believe that the future of the web lies in a proprietary animation engine (Flash) or an ancient and proprietary fat client architecture (Silverlight). At WaveMaker, we believe open-source toolkits like Dojo are the best enterprise Ajax choice a more flexible, open-source browser choice. To be fair, we in the Ajax community still have a lot of work to do to be truly ready to take on giants like Adobe and Microsoft - but that's where the power of the community can make a difference. Speaking of community, you can come find out more about the the Dojo toolkit at the upcoming Visual Ajax User Group meeting. On Thursday, March 20 from 12-1:30 PST, Alex Russell, one of the co-creators of Dojo, will be talking about the Zen of Dojo - how to make Dojo development effortless for beginner and expert alike. Come in person or sign up for the webinar by sending email to rsvp@visualajax.org. What Is Platform as a Service (PaaS)? Buzzwords 2.0: What is Web 2.0? What is RIA? What is Ajax? WaveMaker 3.1: Make Waves, Not Code!